This exercise engages all the glutes, quads, and core. “Home TRX Workout” This video targets Core, and fat loss and adding the TRX to your normal weight training, work over 600+ muscles, travel with TRX, operate in your home, parks, it’s mobile. Quick TRX Finisher Workout for Fat Loss Finisher workout with Flex Marks and myself. Great circuit to end any training session 5 Exercise Circuit — Perform each exercise one after the other for 30 seconds of work followed by 10-second transition time. Go through the circuit two times without rest, as a finisher. Workout Time — 8 Minutes (with rest intervals) TRX Exercise List 1. TRX Push Up and Chest Flyes 2. TRX Side-to-Side Plyo Skater Lunges 3. TRX Superman’s 4. TRX Single Leg Meet the Queen and Pistol Squat – Right 5. TRX Single Leg Meet the Queen and Pistol Squat — Left 6. TRX Standing Rows and Twist “Muscle Building Workouts Using the TRX” This video is for those of you that want muscle building, gain 9-12lbs of muscle with adding TRX to your normal muscle building program. 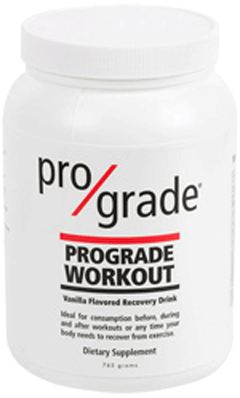 Get serious pumps, builds mass quick, by super setting. 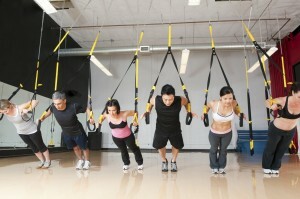 Suspension Training is the perfect body solution because is fully customizable to get you ripped! 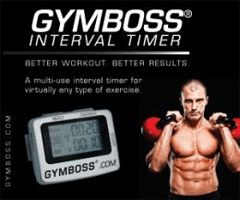 Super set with free weights then jump over to your suspension trainer and engage your core, and you wont believe the muscle pumps you will get that you simply cant get anywhere else! Suspension training will increase the body response to your regular training with machines and free weights with amazing results. Well, if you love these types of workouts, then you need to pick up Dan’s Suspension Revolution. I have it and I love it! 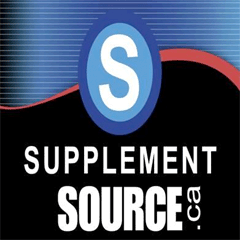 >>> Suspension Revolution This program is packed with 27 suspension workouts plus has over 190 movements! Today’s workout is a Metabolic Circuit using the TRX, Kettlebell and Med Ball. I think it is important to diversify your training as much as possible by using different types of equipment in order to shock your body into strength and muscle growth while continuing to burn fat. Using new pieces of equipment can also expose weaknesses you may have in your body, that force you to improve better yourself. It is also a great way to smash through plateaus and keep things fresh This was a tough circuit for me as I have not been able to use suspension training as much as I would like so a lot of my weaknesses were exposed throughout this session which left me sore as hell for a couple of days. Throughout the circuit you are going to work your explosive power, muscular endurance, core, oblique and abs strength, stability, balance, cardio and mental toughness. Because this is a Metabolic Circuit, after you are done, you will still be burning fat 24-36 hours later. Metabolic 60-15 Kettlebell -TRX – Med Ball Circuit Instructions: Perform each exercise for 60 seconds of work, followed by 15 seconds rest. Make sure you complete as many reps as possible with good form suing each interval. After you complete all 10 exercises, rest for two minutes and complete 3 full rounds Workout Time: 41 Minutes (Warm up before and Stretch After this workout) Exercise List 1. TRX Burpees Right – (Balance, Strength, power and endurance) 2. Two Arm Kettlebell Swing – (Lower Body, explosive power) 3. 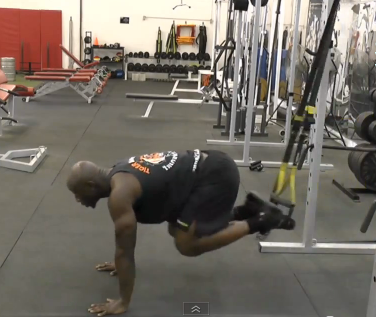 TRX Burpees Left – (Explode off the front leg) 4. Med Ball One Arm Wall Throws – Right - (Hip Rotation, Twist, Push Exercise – Throw each rep as hard as you can do not speed through this exercise) 5. Med Ball One Arm Wall Throws – Left – (Generate power from the hips) 6. 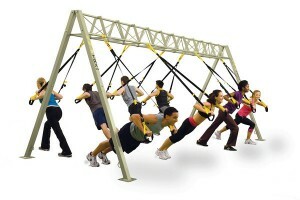 TRX Hip Bridges – (Explosive power, hips, glutes and core) 7. 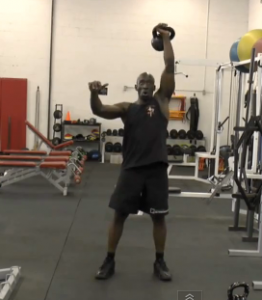 One Arm Kettlebell Thrusters Right – (Strength, power, cardio, legs strength) 8. TRX Atomic Push Ups - (Upper Body, Balance, stability, core and muscular endurance) 9. One Arm Kettlebell Thrusters Left – (explosive, shoulder strength and endurance) 10. KB Cossack Lunge – (flexibility, lateral movement, core strength) Benefits of This Metabolic Fusion Circuit Below I am going to briefly touch on the benefits of using the equipment in this workout and if you have access, then you should learn and incorporate them into your training. TRX Suspension Trainer Whether it’s the TRX, SBT, Jungle Gym XT or any suspension equipment, this is an incredible device to help with stability, balance, muscular endurance, explosion and core training. 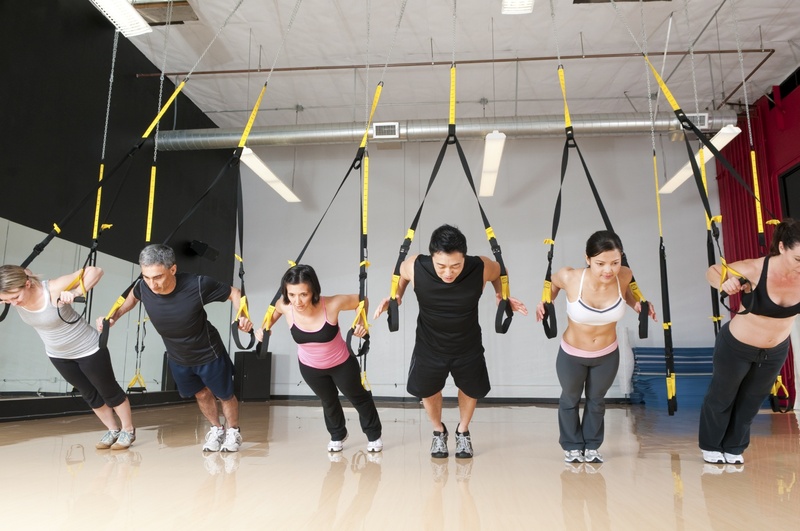 There is a bit of a learning curve using the TRX and because you are suspended in the air for most of the exercises, it stimulates and fires up muscles that you probably didn’t even think you had. Kettlebell This is one piece of equipment everyone in the world should own and have in their toolbox. The benefits run deep when using kettlebells and to this day it was responsible for the biggest body transformation of my life. With one kettlebell you can use dynamic movements increase your explosive power, cardio, muscular endurance, core and grip strength. Because the kettlebells weight is offset, just by holding it in your hand you target the smaller stability muscles that help you build strength faster. Medicine Ball Adding the medicine ball to your training is an excellent way to help you develop strength, coordination, balance, power and core stability. The ball can also help to develop your rotational core strength and obliques.